STREAMING SHOWS AND MOVIES ON YOUR TELEVISION. Streaming content on your main television, whether it be a home theater, or media system, is a great way to enhance your cable or satellite provider offerings. You can get started with streaming content relatively easy and inexpensively. A fast connection to the internet is required. You’ll also need a streaming device such as Apple TV, Smart TV or a capable Blu Ray player. We recommend hard wiring the devices into your home network in order to achieve the fastest possible download speeds. If this is not possible, there are several Wi-Fi options available. 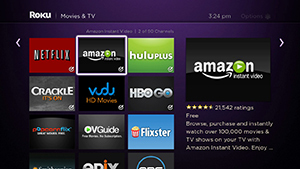 Once your streaming media device is connected, there are various ways to get movies and shows on your TV. Popular options include Apple TV, Hulu, NetFlix and Amazon. Each of these providers have their advantages and disadvantages. We will be discussing these providers in more detail in a later blog. The quality of streaming content is excellent and is 1080p in most cases. That said, your network speed will have a huge impact with respect to smooth playback. If you find that playback is less than optimal, you can call your internet provider and have your speed increased. Apple’s music event on September 1st brought great news to home theater enthusiasts with the release of a new Apple TV. The new Apple TV boasts a stripped down form factor about ¼ the size of older models. This is in part because there is no longer local storage and Apple has stripped down the A/V ports to just an HDMI and Optical audio jack.In terms of functionality, the new Apple TV works as a streaming only device. Therefore, there’s no longer a need to worry about managing storage or syncing an iTunes library. Movies and shows are streamed directly from iTunes as rentals. In addition, Netflix streaming service is now supported with this new model. The best part, is that there’s still the ability to wirelessly stream music, video and photos from your computer at blazing speeds. The Apple TV is scheduled to go on sale in September, with a starting pricepoint of $99.